One Family. 11 Dealerships. Limitless Rewards. With the Mierins Automotive Group, earn extra rewards with no extra effort. As a patron, you are rewarded for your continuing loyalty through our exclusive, members-only Privilege Program. 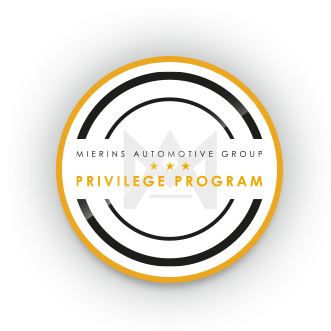 The Privilege Program is offered to new and pre-owned vehicle buyers. If you have any questions, please contact us for more details. private event invitations and stay connected with our newsletter. A reset code has been sent to your email.